The cake itself features three tiers – each a different flavor. I love wedding cakes that have a different flavor in each tier, so in my book this cake is already awesome. 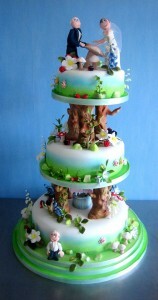 Each tier of the cake is supported by handcrafted tree trunks. Yes, I said hand crafted! And then each tier features an array of colors including the red and white toadstools, blue lavender, red berries, green foliage, and the mutli-colored flowers. There are so many details with this cake I could just stare it at for hours. And of course, a cake this amazing has to have a creative cake topper – in this case it’s hand crafted versions of the bride and groom. The icing on the cake is a white base with pale blue and green that are meant to resemble the sky and the grass. This woodland wedding cake is a truly unique creation and I want to thank Hockleys Cakes for sharing it with us! Keep checking back as we continue to showcase more of their incredible creations.